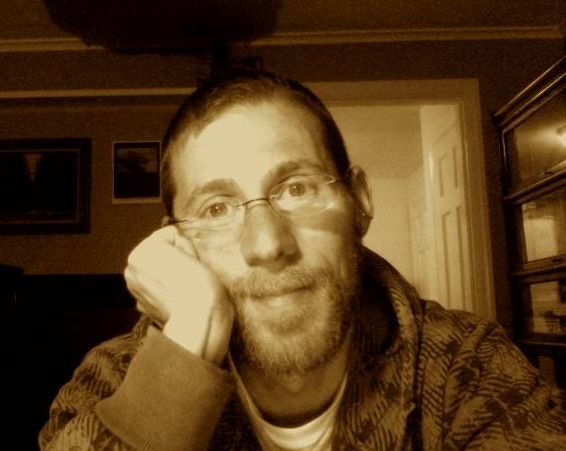 As assistant poetry editor for The Antioch Review, is it the job of Poet Benjamin S. Grossberg, along with another first reader, Melissa Berton, to read the poetry submitted to the journal. They advise poetry editor, Judith Hall, on poems for potential inclusion in upcoming issues. Following is an interview with Ben that is the result of a conversation I started with him a while back. In it, he graciously opens the mysterious black box of how poems get selected and published at a top-tier literary journal, The Antioch Review. I am deeply grateful to Ben for taking time to talk about this process that is important to many of us. In addition to reading for The Antioch Review, Ben is an associate professor of English at the University of Hartford, where he teaches creative writing. His own books of poetry include Sweet Core Orchard (University of Tampa, 2009), winner of the 2008 Tampa Review Prize and a Lambda Literary Award, and Underwater Lengths in a Single Breath (Ashland Poetry Press, 2007). A chapbook, The Auctioneer Bangs his Gavel, was published by Kent State in 2006. His poems have recently appeared in New England Review, North American Review, and the 2011 edition of the Best American Poetry anthology. GC: Ben, you’ve been an assistant editor for several years for The Antioch Review. That means you’ve read hundreds of submissions that have come to the journal for consideration, and have had a hand in helping to select the poems that are published. I want to get into that process because I think it might help those of us who submit our work to journals. But first, can you tell us a little about your work and about your own experience with submitting poems to journals? BG: I have written two full-length collections of poetry, Underwater Lengths in a Single Breath (Ashland Poetry Press, 2007) and Sweet Core Orchard (University of Tampa Press, 2009). My third collection, Space Traveler, will be published by the University of Tampa press in 2012. It’s a book-length series of dramatic monologues in the voice of a space traveler character. I have published poems consistently for about fifteen years now, though that said, I have never published a huge amount, and I still get rejected a lot more (read: a lot more) than I get acceptances—especially by the big name journals. But that’s okay. It means I still get the benefit of a “gate-keeping process,” which keeps me honest. It would be scary, I think, to have the sort of name that inclined people to publish even one’s second-rate work. Not that I’d necessarily turn it down. GC: Can you describe the process used at The Antioch Review for evaluating poetry submissions? What kind of volume do you get? What gets sent to poetry editor, Judith Hall? BG: There are two preliminary readers for The Antioch Review, Melissa Berton and I. The journal accepts submissions fall through spring, and Melissa and I switch off over that period. I review one month, she reviews the month following, and then it is my turn again. The number of submissions varies, but we get between 100 and 200 envelops a month, and each of these envelops contains four or five poems—with the occasional three and six. Our task, then, is to send “finalists” to Judith Hall, what we feel is the strongest ten or so percent. We do not split envelopes: it is the top ten percent of envelopes, not individual poems. I always err on sending a little more, rather than less. If there’s a reasonable chance a poem might find a home in The Antioch Review, Judith Hall should see the envelope. GC: With that kind of volume, you must have to be very organized about your approach. What is your process exactly? For example, how many poems do you read at a time, and how often? right for the journal, and I can move through those quickly. A few poems seem to be excellent candidates for us, and those too can be dealt with quickly. 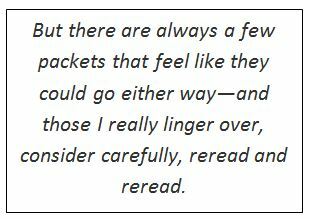 But there are always a few packets that feel like they could go either way—and those I really linger over, consider carefully, reread and reread. They always take a lot of time, and sometimes I’ll take a few days to make a final call. GC: What specifically are you looking for when you read? What makes a poem stand out to you? BG: I think this is an important question, but I fear there’s no way to provide an answer specific enough. I suppose I look for a surety in the use of language: a tautness and a sense of vision. Before I even begin to think about a poem’s subject or its figures, I want to feel a control and an aesthetic on the level of the phrase. After that, I look for high stakes: poems that feel ambitious, important. But it’s hard to be specific about what I look for because the best poems teach us how to read them. The best submissions tell me what I should be reading for; they create the lens through which they should be viewed. I can definitely say this, though: every now and again a great poem comes through, and it’s as if the lighting in the room brightens. Great writing is its own publicist. GC: I am intrigued by the idea that the best poems teach us how to read them. Can you say a little more about that? How do the best poems do that? How do poems create the lens through which they should be viewed? BG: Well, I mean that good poems set their own parameters, their own rules. They create expectations of meaning, imagery, and rhythm, which they then gratify or deny—two different kinds of artistic pleasure. They show by example how a line can work, wake us up to new possibilities, which invite us to read keenly, in order to enjoy and understand those possibilities. In “The Secret Game of Poetry,” Billy Collins says that with a formal poem, the author is playing a “very public game” since everyone knows the rules by which the poem can be judged. For example, you can say whether a line of iambic pentameter is well or poorly executed. But I suspect that’s true of all poems, formal or free verse; they become “public games” as they teach us the graces of their shapes and meanings, teach us on what terms they are to be understood, appreciated, and evaluated. GC: We hear a lot about cover letters and bios. Do you look at those? BG: I do look at cover letters and bios—for a few reasons. The first reason is that we get submissions from some very well-known writers: not an avalanche of such submissions—certainly not enough to crowd out unpublished writers. But we do get some, and I want Judith Hall to see those submissions. The truth is that I do not always feel comfortable rejecting, say, a national book award winner. Judith has a hard job, a good deal of responsibility—to maintain the commitment to quality that characterizes the journal. Is it a cop out to say that some decisions are above my pay grade? Another reason I look at cover letters and bios is that we extend a professional courtesy to editors of other journals. This professional courtesy does not involve automatically publishing their poems, but it does mean their work will be seen by Judith Hall. These two special cases generally amount to say three of the “finalist” envelops each month. That’s all. And I always send at least that many envelops by people who have published little. The work is what matters most. GC: Do you ever suggest changes that would make a poem that you think might have a lot of potential, great? Or perhaps most of it is excellent but there are changes that would make it better? BG: I do not suggest changes to improve poems. Sometimes ideas occur to me, but I try to remember that I am not the writer, and that I have no right to impose my vision. Granted in this particular application—this one and this one only—my vision has a little authority behind it because I am acting as the representative of The Antioch Review. I sort of borrow (briefly) the journal’s authority. But even The Review has no right, finally, to correct someone’s artistic vision. 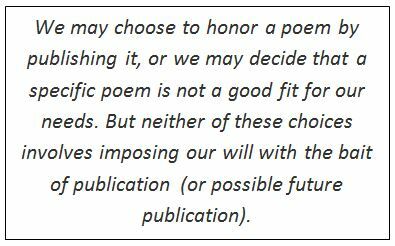 We may choose to honor a poem by publishing it, or we may decide that a specific poem is not a good fit for our needs. But neither of these choices involves imposing our will with the bait of publication (or possible future publication). So, no: no suggestions. I understand why some poets like them; I sometimes like them myself. But I do not feel right offering them. GC: If you recognize the name of a poet do you look at it differently than you would for, say someone whose name you do not recognize or who is just starting to submit their work? BG: I try to minimize any kind of preferential treatment. I will say that I often do not send Judith Hall the work of writers who have published multiple books; and I often do send her the work of writers who have not published a single book. So if it does affect me (and I hope it does not), the effect is certainly not enough to overcome the quality of the work itself. GC: Having been an assistant poetry editor for such a prestigious journal, do you have any advice for newer poets who are just starting to send their work out to journals? BG: Believe in your poems. 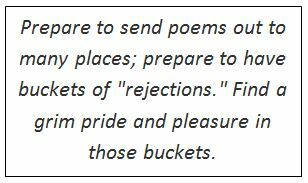 Prepare to send poems out to many places; prepare to have buckets of “rejections.” Find a grim pride and pleasure in those buckets. A few years ago, I was lucky enough to have a poem in the Pushcart anthology. That poem was ejected by seventeen journals before it found a publisher. The logic of my advice might well be: persevere and you are much more likely to succeed. And I think that’s true. But I encourage writers to believe in their work because publication can’t and finally doesn’t validate poems. The more reason you can find in yourself to love of your own work, the better suited you will be to weather the vicissitudes of this business, and the happier you will be. This entry was posted in Poetry Business and tagged Benjamin S. Grossberg, Grace Curtis, Poetry, Poetry Journals, Submitting Poetry, The Antioch Review. Bookmark the permalink. Thank you! I’m glad you liked it. So nice to hear from you. It was great to meet you at the Midwest Writer’s Workshop. Hello Grace! Good interview. The numbers of poems travelling via snail mail and email always amaze me. It is good to hear Mr. Grossberg remind us to believe in our own work. The pleasure of knowing one’s poem may reach a larger audience can only be a small part of the joy one takes in writing. So good to hear from you, Maureen. Thank you for taking the time to comment on this post. I agree. It is a pleasure to think about our poems reaching a larger audience. I take comfort too in knowing people like Ben are the ones sometimes reading submissions. It feels like a fair shot.